Synopsis: Christopher Robin, the young boy who shared countless adventures with his stuffed animal friends in the Hundred Acre Wood, is now grown up, living in midcentury London and dealing with the stresses of adulthood. As an efficiency manager at Winslow Luggage, he juggles long hours in the office with his commitments at home and has all but forgotten the endless days of wonder and make-believe that defined his childhood. But sooner or later your past catches up with you. After canceling plans to go away with his wife, Evelyn, and daughter, Madeline, in order to work through the weekend, he is reunited with Winnie the Pooh and his old friends from the Hundred Acre Wood, remembering the times when doing nothing with a best friend was the very best kind of something. But as Christopher Robin returns to London to address financial problems at the company, some important work papers from his briefcase go missing, and the animals decide that it is up to them to save their friend. Following a chance encounter with Madeline, Christopher's young daughter, Pooh, Tigger, Eeyore and Piglet leave the forest and take an excursion into the city to hand-deliver the documents to the offices of Winslow Luggage, surprising Christopher Robin. As a result of their efforts, he begins to see things from a fresh perspective and comes up with a plan to save the company as well as his job, and in the process rediscovers the joys of family life, the value of friendship and remembers to appreciate the simple pleasures in life once again. The Genesis of "Christopher Robin"
The characters Christopher Robin and Winnie the Pooh first appeared in a collection of verses written by English playwright turned author A.A. Milne entitled "When We Were Very Young" in 1924, but it was the publication of "Winnie-the-Pooh" in 1926 that truly resonated with readers around the world. The book of short stories about the imaginary adventures of the carefree boy, his honey-loving bear and the rest of his animal friends from the Hundred Acre Wood, accompanied by E.H. Shepard's timeless illustrations, is considered one of the most popular children's books of all time. Additional stories by Milne featuring the beloved characters followed with the publication of "The House at Pooh Corner" in 1928 and were equally as popular. Since then, these stories have been embraced by readers of all ages, and the affection for the characters has continued to grow, reaching across all mediums to endure from generation to generation. Milne's stories advocate the values of a healthy imagination and represent a time in our lives when we have to say goodbye to childhood…goodbye to unlimited free time…goodbye to a mother's protection. In fact, "The House at Pooh Corner" ends with Christopher Robin telling Pooh he's going away to boarding school, his way of saying life can no longer be about frivolous pursuits and that it's time for him to grow up and become more serious. It was this bittersweet moment in Milne's book that served as the inspiration for an entirely new take on these classic characters set years after the two friends part. The idea of approaching the story from this perspective dates back 15 years to when producer Brigham Taylor, then a production executive at Disney, pitched this idea to the studio. Though the timing wasn't right as there were other Winnie the Pooh projects in the works, Taylor and his colleagues knew there was a special kind of promise to the idea of meeting a familiar and beloved character in a whole new world. Years later, Taylor transitioned into a producing role for the studio, taking on films such as "The Jungle Book" and "Pirates of the Caribbean: Dead Men Tell No Tales." During a meeting with longtime executive Kristin Burr, she encouraged him to dust off the concept and the two began developing the idea together. "The studio was really supportive of taking classic characters and finding ways to reinvent them and tell new stories, so it was sort of a revival of an old idea that we had," says Taylor. The simplicity of Milne's characters appeals to children, and their imperfections"timidity, bravado, a false sense of superiority"are easily recognisable to adults. They show warmth, love, kindness and connectivity with one another, especially Pooh, and the issues are ones we can all relate to: the responsibilities of adulthood that pull us away from the carefree days of our youth and how we go about recapturing what we've left behind. Winnie the Pooh, who often makes insightful comments such as People say nothing is impossible but I do nothing every day, is the conduit by which Christopher Robin is able to pull himself back and remember the things in life that are valuable to him…things that can still be a part of his life as an adult. "Pooh is the perfect vehicle because he literally represents"through his image, his attitude and his personality"the concept of just hanging out and doing things that you love with people that you love and not being distracted by less important things," says Brigham Taylor. Once a working script was in place, Taylor and Burr approached Marc Forster and were thrilled when he came aboard to helm. The acclaimed director known for his eclectic range of films"including "Finding Neverland," "Quantum of Solace" and "The Kite Runner""grew up loving Disney live-action films and was immediately drawn to the story. It had a sense of magic realism, and he believed it had the potential to become an artistic, emotional, funny and timeless film. "When you are able to make people laugh and cry in the same movie and you are able to tell the story with integrity and ground it in reality and have the magic realism on top of it, it lifts your spirits and connects you with the people you love," says Marc Forster. And this is a story Marc Forster believes has never been more relevant. "I think it's something we desperately need in the world," he says. "We could all use a little bit of Pooh's heart and wisdom right now." Marc Forster and Brigham Taylor began prepping to shoot in London as Burr transitioned into her own production shingle on the lot, making the transition from executive to producer. At the same time, they turned their attention to casting both the human and animal characters. 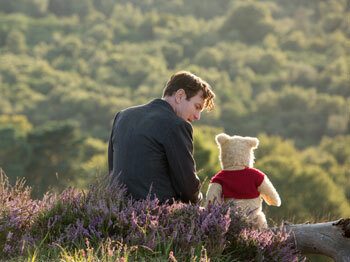 Finding someone to personify an adult Christopher Robin posed a unique challenge for the filmmakers. The boy forever immortalised in E.H. Shepard's iconic illustration sitting with his best friend on their thinking log has grown into a loving husband and father and a hard-working employee at Winslow Luggage, but the burdens that come with adulthood have caused him to forget the good times of his youth and he has lost sight of the person he once was. "Christopher Robin feels a lot of responsibility and a lot of guilt, which weighs heavily on him," says Burr. "He doesn't smile anymore, he doesn't laugh anymore and he doesn't act silly anymore, and by attempting to support his family and secure their livelihoods he is actually neglecting them." Marc Forster adds, "Christopher Robin tries to relate to his wife Evelyn and his daughter Madeline, but he's not able to connect to himself, and until he develops that kind of personal awareness, he isn't able to emotionally connect with his family." "There were very few actors who could give us that sense of weariness that sets in as adults with responsibilities weighing you down, but also let you see that boyish nature that lies underneath," says Brigham Taylor. "Ewan McGregor is able to take you on that journey visually." The star of "Moulin Rouge!," "Trainspotting" and "Star Wars: Episode I – The Phantom Menace," who recently appeared in Disney's live-action "Beauty and the Beast" and the acclaimed FX series "Fargo," immediately related to the character of Christopher Robin. 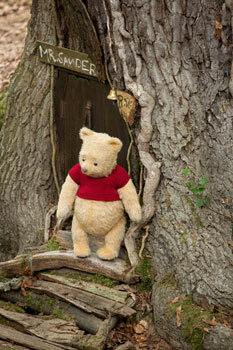 He was also pleased to see that Pooh and the other creatures were such an integral part of the story. "I was quite charmed by the script and loved that they made Christopher Robin a man my age and that Winnie the Pooh comes back to him at a difficult time in his life," says Ewan McGregor. "I found that really moving. 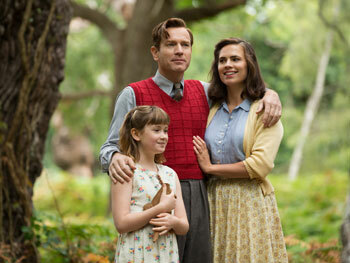 Christopher Robin is the father of a daughter who he's not very close to, and he recognises that and would like to be closer to her. And certainly, you get the feeling that she would like to be closer with her dad as well, and there's something about this coming together of a father and his daughter that really appealed to me as a father of girls." He continues, "I've always loved the films of Jimmy Stewart, and I could imagine Jimmy Stewart playing this role back in the day. Reading the script made me feel like this might be my Jimmy Stewart sort of role." As the efficiency manager of a luggage company in the years following the war, when most people can't afford to go on holiday, much less purchase luggage for the trip, the pressure to keep the company afloat and protect everyone's' jobs rests on his shoulders. "Christopher Robin works very hard and probably works too much, and his relationship with his family is strained as a result," say Ewan McGregor. 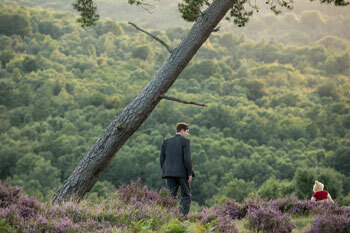 "Ewan McGregor and I worked together before [in the 2005 thriller "Stay"], and I knew he was perfect as Christopher Robin," says director Marc Forster. "He has this sense of manliness about him but an incredible playfulness as well, which was really crucial for this character." The role of Evelyn Robin also came with its own set of casting challenges. "You don't want to have someone play this character in a two-dimensional way and come off as a nagging housewife," says Marc Forster. "You want to make sure the actor has her own dramatic strengths and comedic skills to keep the character very much alive." 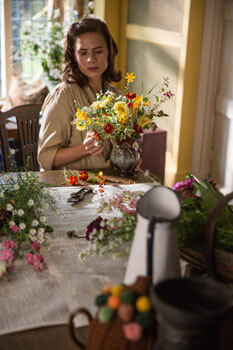 Hayley Atwell ("Howard's End," ABC's "Agent Carter") was cast as Evelyn Robin. 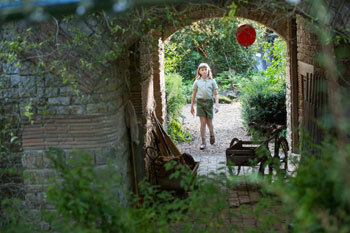 A fictitious character married to Christopher Robin, she personifies home and love and holds the family together. "They were very happy at the beginning of their marriage, but she sees him becoming a workaholic and losing that connection with his family," says the actress, who previously worked with McGregor on Woody Allen's "Cassandra's Dream." She continues, "He is clearly traumatized by the war and overworked and trying to find his place in the world, yet Evelyn and Madeline are right there in front of him and are everything he could possibly need." Bronte Carmichael plays Madeline Robin, the bright nine-year-old who, much like her father, has a passion for make-believe. She wants nothing more than to have her father read to her every night before she goes to bed, but he wants her focused on her studies. "Bronte is incredibly sweet but also very soulful, and she has an ability beyond her years in terms of portraying the emotions of her scenes," says Brigham Taylor. "It was very exciting seeing her at work." "Madeline is a very serious girl at the beginning of our story and really wants to please her father, studying very hard all the time," says Marc Forster. "She is prepared to go to boarding school, but what she really wants is to stay home with her family." When Madeline comes across a box belonging to her father with a drawing of Pooh and his friends along with other keepsakes from the Hundred Acre Wood, it gives her a glimpse into his childhood for the first time. "Times were different then, and so was the way people related to their kids," says Ewan McGregor. "You can see that she wants love from him in a way that isn't just him providing for the family, and that's what the story is about really, and by the end of the film he is able to give her that." Mark Gatiss ("Sherlock," "The League of Gentlemen") plays Giles Winslow, the spineless and incompetent son of the company's owner who oversees the day-to-day operations at Winslow Luggage. 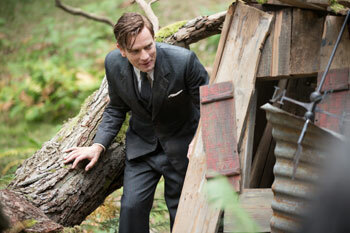 When the company is in danger of going under, he puts Christopher Robin in charge of finding a solution. Jim Cummings provides the familiar and comforting voice of Winnie the Pooh, Christopher Robin's devoted best friend. A cuddly, slightly-worn teddy bear full of optimism, whose tummy is always rumbly, he often delivers simple thoughts on life that turn out to be surprisingly profound. Jim Cummings has voiced the character for the past 30 years. "We were so lucky to get Jim Cummings," says Burr. "As soon as you hear him read his lines, a feeling of nostalgia washes over you and makes you smile." Jim Cummings also provides the voice of Tigger, a character he has voiced in numerous titles over the years. Tigger is the fearless, outgoing, energetic and incredibly self-assured orange and black-striped tiger who often leaps before he looks. Brad Garrett of "Everybody Loves Raymond" fame has voiced characters in a number of Disney animated titles, including "Finding Dory" and "Ratatouille." In "Christopher Robin," he is the voice of Eeyore, the old gray donkey with a melancholy"but endearing"disposition and a penchant for sarcasm. Eeyore tends to wallow in misery and proceeds through life with very low expectations, but he is loved by Christopher Robin and his friends. British actor Nick Mohammed ("The Martian," "Absolutely Fabulous: The Movie") is the voice of Pooh's sidekick Piglet, a petite, angst-ridden pig who is shy, soft-spoken and easily frightened. The kind-hearted female kangaroo, Kanga, is voiced by Sophie Okonedo ("The Secret Life of Bees," "Hotel Rwanda"). Kanga is mother to Roo and a warm and maternal figure to Christopher Robin and all the animals. Toby Jones ("Jurassic World: Fallen Kingdom," "Tinker Tailor Soldier Spy") is the voice of Owl, who, while undoubtedly wise, is a stickler for rules and order and has a tendency to pontificate and embellish his true intellectual abilities. Peter Capaldi ("Doctor Who") provides the voice of Rabbit, who often butts heads with Owl. He is the self-appointed leader of the animals in the Hundred Acre Wood, but often comes across as pompous and overbearing. The creative team put in place by director Marc Forster on "Christopher Robin" includes: director of photography Matthias Königswieser ("All I See Is You," "Perfect"); production designer Jennifer Williams ("The Amityville Horror"); Oscar®-nominated film editor Matt Chessé, ACE ("Finding Neverland," "Quantum of Solace"); and two-time Academy Award®-winning costume designer Jenny Beavan ("Mad Max: Fury Road," "The King's Speech"). While Marc Forster originally aligned with Oscar®-nominee Jóhann Jóhannsson ("Sicario," "The Theory of Everything"), the composer sadly passed away just as he began working on the project. The film includes a dedication on his behalf. Subsequently, GRAMMY®-nominated composer Jon Brion ("Lady Bird," "Trainwreck") was brought in, with additional support coming from Emmy Award®-winning Geoff Zanelli ("Into the West," "Pirates of the Caribbean: Dead Men Tell No Tales"). Disney legend Richard M. Sherman provides three new songs for the film. Two songs appear in the end credits and one, "Goodbye, Farewell," which is performed by the animals from the Hundred Acre Wood, can be heard in the opening scene. "Busy Doing Nothing" and "Christopher Robin" are both performed by Richard Sherman himself. "Winnie the Pooh became a dear friend of mine when Walt gave us the assignment to write songs for the first Winnie the Pooh short film," says Richard Sherman, "and here, so many years later, it is very special to be back in the Hundred Acre Wood again." Richard Sherman continues, "There's something sentimental and sweet and nostalgic about Pooh. He's like your childhood buddy, who we sometimes forget about when we get older, but when he finds out that Christopher Robin is in a bit of trouble, he comes back to remind him what it's like to have an imagination and to have wonderful times together doing nothing." 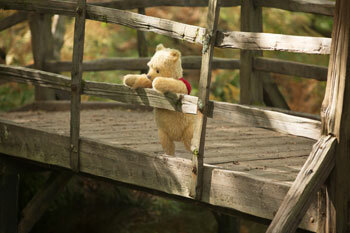 "I think Pooh will be around for the next 200 years because he is so special and so dear," he says. "There will always be people rediscovering Winnie the Pooh or finding about him for the first time." The two-time Oscar® winning composer and his late brother, Robert B. Sherman, who passed away in 2012, wrote the music and lyrics for the majority of the animated films featuring Winnie the Pooh and his friends distributed by Disney ("Winnie the Pooh and the Honey Tree," "Winnie the Pooh and the Blustery Day" and "Winnie the Pooh and Tigger Too," among numerous others). They also wrote scores for such iconic Disney films as "The Jungle Book" and "Mary Poppins." Principal photography on "Christopher Robin" took place at Shepperton Studios outside London and on locations throughout the U.K. Supervising locations manager Emma Pill ("Spectre," "Cinderella") and production designer Jennifer Williams both began researching the project in January 2017, studying E.H. Shepard's original watercolor drawings from the A.A. Milne books which are housed at the New York Public Library, and visiting Ashdown Forest in East Sussex for inspiration. The Hundred Acre Wood from Milne's books, an enchanting place where Christopher Robin's animal friends reside and where imaginations thrive, is based on Ashdown Forest and, more specifically, an area in the forest known as the Five Hundred Acre Wood. Located in the lush Sussex countryside about 30 miles south of London, the woods are still visited by thousands of tourists every year, all eager to walk the areas featured in the Winnie-the-Pooh stories. But, according to Marc Forster, the Hundred Acre Wood is more than just the place where Christopher Robin played with his friends as a child. "It represents the discovery of nature and play-time and the concept that there's nothing more important than taking your time," he says. 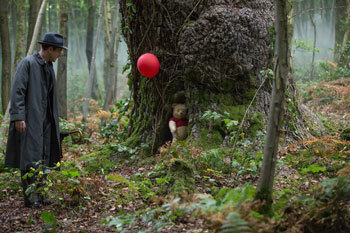 And it was important to the director that the Hundred Acre Wood seen on screen looks and feels similar to the one from Milne's books, so scenes taking place in the Hundred Acre Wood were filmed in the real Ashdown Forest (as well as in Windsor Great Park). He also wanted the bustling city streets to provide a stark contrast between this real world and the natural world that is the Hundred Acre Wood, as seen through the eyes of both Winnie the Pooh and Christopher Robin. Pill and her department of 20 spent weeks looking for London streets that were similar in style to the paintings of English artist L.S. Lowry and which could look busy and evoke the time period. Seventeen main unit locations in the U.K. were used during filming, many of which were London streets and U.K. thoroughfares, including: the intersection of Great Smith Street and Great College Street; Inner and Middle Temple Lanes; Lambeth Bridge and County Durham's Hownsgill Viaduct. Vintage action vehicles and hundreds of period-attired extras were used to help fill the streets and sidewalks. The characters created by A.A. Milne that reside in the Hundred Acre Wood are the heart of the film, symbolizing the simple, idyllic pleasures of childhood. 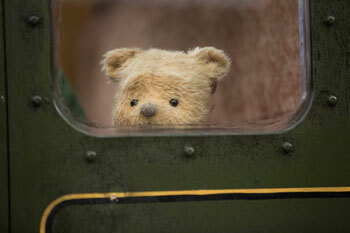 Winnie the Pooh, Tigger, Piglet, Eeyore, Kanga, Roo, Rabbit and Owl make their first appearance in a live-action film as three-dimensional characters in "Christopher Robin," something that would not have been possible five years ago without the sophisticated computer animation technology that exists today. 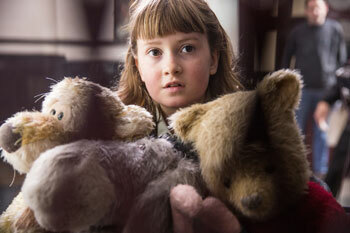 Cinematographer Matthias Königswieser chose to shoot the film with traditional handheld cameras to help the stuffed animals' motions look more believable. 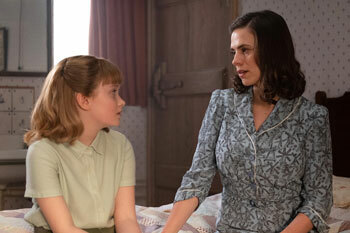 They would then be brought to life via photo-realistic computer animation in post-production, which would immerse these characters in mid-century London as well as in nature. But first, individual looks for each character had to be designed. The process was a collaboration among creature visual effects, visual effects and the costume, camera and art departments, with Marc Forster supervising the designs. It was important to the director that the stuffed animals look real, not animated. Forster worked with character concept artist Michael Kutsche ("Ant-Man and The Wasp," "Thor: Ragnarok") early on in pre-production to discuss what he envisioned for each character, which included elements of E.H. Shepard's watercolor illustrations, the early animated films and worn-out stuffed toys that had been played with for years. Conceptual art of the final designs was then provided to the creature visual effects team at Animated Extras, the Oscar®-winning special effects shop at Shepperton Studios. Actual stuffed animals (or "stuffies," as they were affectionately referred to on set) were physically created for reference when blocking scenes and for interaction with the actors. "We wanted to make it easy for the actors to interact with something that wasn't actually there but at the same time know exactly where they should be and how they should move," explains Taylor. "We spent a lot of time determining how they were going to move in real time and space so we were sufficiently prepared when filming." A great deal of care also went into their creation, with special attention being paid to Winnie the Pooh's tummy (to make sure it had the proper cuddle factor), to Tigger's expressions (so he could effectively register surprise, anger and bewilderment) and to Eeyore (to make sure he had the proper amount of sag). These efforts were greatly appreciated by the talent, as the human interaction added gravitas to their performances. "Marc is a very trusting director with the people he has asked to work with him," says Ewan McGregor. "He gives you guidance when needed, but he makes it feel like it is his and my work and that he's not imposing very much on me, which I liked." Adds Hayley Atwell, "Every so often he'll do something out of left field or he'll really like what an actor is doing and want to explore that further. He's an independent, original mind, and when he is taking characters that are so well known and so beloved, he obviously respects them, but then he comes in and puts a little bit of his own take on it." Oscar®-winning visual effects companies Framestore ("Blade Runner 2049," "Avengers: Infinity War") and Iloura VFX ("Thor: Ragnarok," "Game of Thrones") stepped in upon completion of principal photography to create the final computer-generated character animation, taking care not to make the stuffed animals look too polished but aged and loved, and a little rough around the edges.